FALL FLY FISHING JUST AROUND THE CORNER, TIME TO BOOK YOUR STEELHEAD, SALMON & TROUT TRIPS! This Fall Give Us A Call, We Have Your Up To The Minute Information On Fly Fishing The Pacific Northwest & Worldwide Connections. 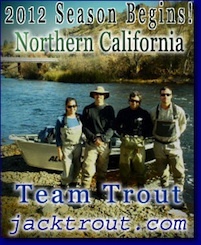 Jack Trout Fly Fishing International & Tours, Operates In 17 Countries, California, Oregon & Nevada. Thank you for all your support over years and all the great experiences, we could never do it without all of you. Hugs & High fives, Jack & Carola Trout & Team Trout International Fly & Tour Guides. Many great expeditions down the Upper Sac this year. With all the water coming down from the peaks of Mount Shasta, I am still doing floats into August and by far this is my best year ever. The fishing was terrific this season with the prime months being May & June, with the normal slow down after July 21st as we entered the dreaded “Dogs Days Of Summer.” It’s always great to be out there, but just about every where this summer on all North State rivers, fishing in temps of a 100 or more were kind of slow on the fishing, but great on the eyes and the soul. Scenes like this in freezing temps can warm the soul, and just the thought of what could be in store this winter makes one want to get out more in the coming months, for this guide thinks, it will be even bigger than last year. Ralph on a hillside eating his daily catch, saving half for Marge his wife up with their new eaglet in the nest. As he enjoys another piece of the trout he caught in the Upper Sacramento River, Ralph’s a happy man these days, he’s got purpose, he’s got food for the family, life is good people! Meanwhile the trout are hungry after a long winter and for them, seeing bugs in the Upper Sac is like staring through a glass of English gin. As the summer progresses, the big selection and size dwindles from size 14 to size 20. You know how you are in late summer versus late fall, you’d trade in a t -bone steak for a nice glass of ice tea at supper. You don’t eat as much in the mid summer, most hunger appetites develop as the mornings get colder and thus is true for our slippery scaly friends who breath near their ears, extracting oxygen from the rivers they live in, and the colder, the better. As the summer progresses the rivers flows become less and looking for the edges of white water is paramount for success. High sticking, slowing the fly down and using very small nymphs is key. Many happy first timers on my trip, with great access not possible by land, air or foot. Beef Dog, extremely happy just to be apart of your trip, trying to get the trout to bite for you. Solving mysteries, without any clues, Beefy Trout is ready for action! Game Face! Game Face! Game Face! We had all kinds of legends out on the water this year. It has been one for the ages, what a fantastic season we are having. But as you can see, the term; “Match the hatch.” truly is symbolic here, you can sit down at the vise and learn how to make your bugs look like what’s out on the water. Plus saving yourself a lot of money buying them all the time at the fly shops for a buck fifty more . I want to offer any of my clients at anytime, if you book a trip with Jack Trout Fly Fishing International, you get a free fly tying lesson at my house. This is a great offer for families with kids, especially ones going to college and can’t get out enough with the school load. Learning to tie flies can help you prepare for the next time you’re out on the water. It’ s really a great hobby and everyday, I like to tie at least 6 bugs, it’s something I really look forward to. So all you out there that want to learn, come on by! I just returned from traveling the Oregon coast and Northern California with my husband and twin teenagers. 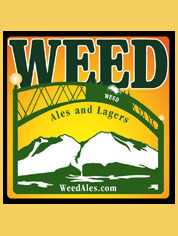 A great trip that included a side trip inland across Grant’s Pass to Mount Shasta. Here we met our private guide Dale Langstaff who spent the afternoon dividing his time between the 4 of us as he introduced us to fly fishing. Dale works for Jack Trout Fly Fishing business. It was such a great day. Perfect weather. Dale provided us with everything we needed-poles, flies, waders, and boots. Carola (Jack’s sweet wife kept good communication with us as to where to stay/eat/and obtain a license prior to our trip). Dale was very patient as he gave us individualized instruction on technique with casting and the art of landing the fly upriver so as to mimic an actual fly. He was very knowledgeable as to the river, the local fish and the various flies and ties. 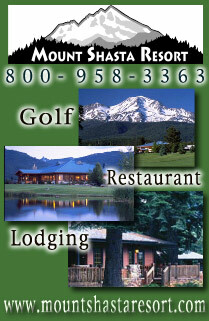 He further told us about the Mount Shasta area, (since he was raised there) as he cooked us a delicious riverside lunch. It was a lot of fun-something we always wanted to try. We would highly recommend this trip and having Dale as a guide. We hope we can someday go again! Maybe Belize? We Can Set You Up With Art Teter On The Fall River, Give Us A Call For Updates On Fly Fishing. 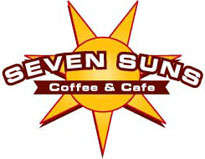 Check out our Fall River, California Page. Now is the time to set up your Fall River trout trip for September, October to November 15th. GUIDE ART TETER FALL RIVER GUIDE EXPERT OVER 25 YEARS EXPERIENCE & AREA RESIDENT. Some of the trout grow to enormous sizes and when you take into account that you could possible catch these monsters on dry flies and that some of the biggest trout are caught in the fall on Fall River, this might be a place to consider, especially if you plan to come up to our area for multiple days. The Coveted Hex Hatch that comes out every June is the largest of all mayflies and comes out right before dark. The river comes alive with trout jumping all over the place like someone is throwing out bowling balls from the shorelines in light I’ve seen better in, in some disco lounge from the 1970’s. Sometimes your hearing is more important than your gun sight. Kids love Fall River, especially with mom or dad, it’s certainly a trip highlight in the making. My dad use to say; “You get to add three inches if you catch it on a dry fly!” 🙂 Good on ya Pops! Guide & Local Resident Dale Langstaff With A Nice Bow From Fall River. Wading, fishing, catching, feeling the water as it brushes against your legs and you feel completed. You’re back to square one, you’re ready for anything, because you embraced your nature and it stuck with you. Natures treasures.. That’s what I’m talking about, the full circle of life and staying on top of your game. You know how you feel when enough is enough, it’s time to get back out there, feel the magic at your feet. Might like to go down with him, check out the views, get a little crazy and really enjoy the water you’re in. Bring your pops with you, having some big time bonding moments, something you both will never forget. Catch the most amazing and beautiful trout of your life in surroundings you can call your second home. You got friends out there, we’ll be with you all the way. Always amazes me when we catch trout in this clear of water so close to the boat. Some of which are very respectable, worth bragging about, that’s why we release them, we like them big! Some times a client brings a unique fly and that’s the fly of the day. You never know, I always think of it as a team effort, if you got them. otherwise, I’m tying everyday and all of my guides have you covered. We offer all the gear with our trips, including flies and one of the best shore lunches in the industry. I anticipated just a fly fishing trip on a raft. What I experienced was an extraordinary adventure! As soon as Jack and I launched the raft. I made my first cast and landed my first fish of the day. I expected a day of quiet drifting and plenty of fish. I could not have imagined the thrills and scenery that lay ahead: the class III and IV rapids between pools, the splendor of the forested canyons, the eagle siting. Jack’s knowledge of the river, his stories, his wife Carola’s gourmet lunches, all added to this amazing adventure. One of my favorite runs is from Sims to Pollard, so many places to stop and fish, plus tons of pocket water. Some real rod bending anvils with a motor in this river, for about a 2 week period, we were having a hard time landing some of the bigger trout up from Shasta Lake. Ripping out line like a Greyhound trying to catch up to Joey Chestnut on the 4th of July! Another one for the record books, the best year ever on the Upper Sac Raft Fly Fishing Trip, in 22 years. 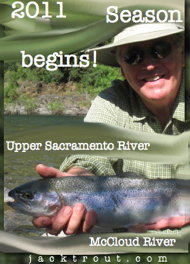 For my 59th birthday my lovely wife Susan paid for a rafting/fishing trip on the Upper Sacramento River and for the guide I chose Jack Trout, whom I have been listening to/ following for years. As my only other guided trip was a joyless experience I wanted to make sure this one was fun and Jack did not disappoint. My buddy John (a complete fly-fishing novice) and I(whatever the fly-fishing equivalent of a duffer is) sorely tested Jack’s skills with our ineptitude yet he maintained a positive attitude throughout the trip. He put us on a bunch of fish(of course the newbie got more! ), one of which would have made Ahab drool. Jack’s lovely wife Carola made real food for our lunch, not some stiff, pre-packaged sandwiches. The fish, the float, the food-all of it added up to a real good time. If the two of us couldn’t destroy Jack’s sense of humor and professionalism, I doubt such a thing is possible. It is clear he earns every penny of the price of a trip, this one in spades! 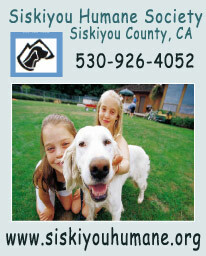 Get on up to the Shasta area and give him a call, you won’t regret it! And be forewarned, Jack- we’ll be back! There is only one thing better then being with your son’s. That is trout fishing with your son’s. I asked Jack Trout to deliver a great trip for my son’s. He hit the ball out of the park. Historian, ecologist, storyteller and yes, lover of everything trout. Jack will deliver. Couples fly fishing, what could be better than being and learning a new sport with the one you love. Bends are always good to fish on any river, it provides fish with cover and are easily fished from the shorelines. Success! Another beginner that walks away with more knowledge then when they showed up. That’s so cool! I don’t claim to be the best guide out on the river, just one with a purpose to teach and have fun. Beef saw a trout rise folks! Happy Campers is what I’m talking about in an environment that’s all about good. So we high stick the fly by hold the tip up a little to slow the fly down and allow the trout to see the fly suspended making it an easy meal, almost spoon feeding it to the trout, while staying attached by lifting the line up. Some days are boat days, some days we need to get out and access closer to the shores without scaring the trout wit the boat, it all depends on the day.. But the usual success prevails based on what the guide figures out during the day, the bug selection and locations that are key. If there ever was a year where you needed to hire a guide, it was this season. Lunkers usually caught right before we end the trip is the most rewarding part of the day. Midges at the vise are important this time of year as variations of this pattern is something not always found at fly shops and not for 36 cents tied on your vise at home or on the water. Make a creation that screams to the trout, only one that you could dream up if given the chance. It’s hot out there! It’s a good thing this breed came from a place that’s even hotter. 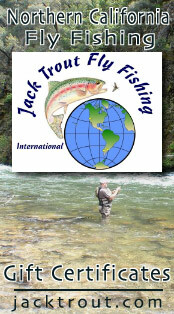 Jack Trout Fly Fishing International is the beginners and kids fly fishing guide service. 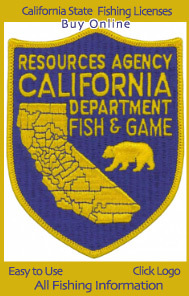 That’s why we are the #1 fly fishing outfitter in the world on Tripadvisor, no one else in California is even close. Plus you can count on always the gear being included in our price and the best shore lunch in the industry, we are not into serving sandwiches folks. Sucess is what we are into, teaching the youth skills that can help them in their lives down the road. Like how to catch your first trout on a fly rod, the most important things to know in life, like how to access nature with family. Now that’s what life should be about, not iphones, tv or anything man made. Jack Trout Fly Fishing Guide: The Real Deal! Jack Trout is the real deal as a well seasoned, expert guide for fly fishing. Be sure your ready for an exhilarating adventure and a satisfying, unique experience. With my 8-year-old daughter, wife and mother-in-law, we drove off-road a bit and trekked along the McCloud River easily landing 7 Rainbow Trout! Jack provided the reels & tackle and provided real time instruction on the fly (puns intended). My daughter was ecstatic with her 6 catches and enjoyed the company of Jack’s sweet collie,”Beef”. Next, we hiked over some pretty hairy cliffs overlooking the fierce river rapids below the dam. If you go to that spot, you may want to wear thin life jackets in case anyone slides into river! My wife landed a sizable Rainbow Trout there. All-in-all, a fantastic family experience! We look forward to the next time! The outdoors can make you whole again, it can bring you back to when you were a kid and enjoyed not so adult things in your life. The rivers will teach you anything you need to know about life, it’s all there to reboot that intel pentium processor in your brains. Another happy youth taught how to fly fish, and so the story continues and many more to go I know. Mount Shasta, California – 14162 feet and the tallest profile in North America, 11,000 vertical feet. Sometimes over the summer we get people from foreign countries for a short half day excursion. Even a first timer ever fly fishing can catch a real big trout on a short day out with the fam. It can be a real worth while endeavor with the kids! Holy cow! Ralph and Marge had a baby and he named her Liberty!! A bald eagle’s wingspan ranges from 75 – 90 inches. A bald eagle’s eyesight is estimated to be 5 to 6 times sharper than a human’s. The bald eagle was adopted as our national symbol on June 20th, 1782. Wild bald eagles may live as long as thirty years. Hunting area varies from 1,700 to 10,000 acres. Home range size is smaller where food is more abundant. Bald eagle nests are among the largest in the world. On average, bald eagle nests are 2 – 4 feet deep and 4 – 5 feet wide. The largest nest ever found was 20 feet deep and 9.5 feet wide and weighed over 2 tons. Bald eagles lay from one to three eggs and incubation is 35 days. Incubation duties are shared by both male and female bald eagles. The nesting cycle is about 20 weeks – from preparing the nest to the young leaving it. Lower Sac is in our backyard, come on up September is always a great month! Forest Brizendine has guided for me for over 10 years now, clients have caught trout like this with him, maybe it’s your turn? But not our clients, they wanted another hook up! Hey Jack, we could definitely fish those days! The 15th would be best for me, but between Neal and myself we have it open. There are still a lot of fish in the estuary, but up river should be picking up especially with the little bit of weather we are supposed to get today and the pressure change. Starting to see numbers of steelhead as well as still seeing salmon around. This pic is from David’s trip. The coastal cutthroat fishing in the estuary is pretty unbelievable, the fish are obviously a little smaller, but they are always there and some good sized ones. July is the time this year for salmon in the estuary, it’s a great month and we catch a lot of really nice fish. I’ve been fishing the Rouge and Chetco bays as well and have done very good. I have a few pictures if you need them. Here is the link to the house on airbnb. http://abnb.me/EVmg/muAaOcY99D it’s listed for $285 a night and a cleaning fee of $89. Check it out and let us know what you think! We can do a special rate for guests who wanna fish with us of a flat rate of $250 a night. I have been out of service a lot this week fishing so sorry for not responding to you. Fishing has been good lately, good numbers of spring salmon coming up river, and we have been catching some summer steelhead as well swinging flies. Let me know if there is anything you need from me I’ll have my phone on me today. This week will be great springer fishing, thanks kenton. Ya we are fishing the Klamath right now out of the jet boat from here till October. Late July early August can be a good time do be out here fishing the tide water and also up river. We usually get our first big push of steelhead and there are always some salmon around. It’s a fun time! I wanted to thank you so much for making our trip a truly memorable one. My Son and I had a fantastic time both days! Your true professionalism and attention to detail was just fabulous. Our day on the Upper Sac was a blast. Both Andrew and I love to be involved and helping you along the way made the day very special. The scenery and beauty were almost as nice as the lunch you prepared, Ha Ha. As you mentioned the coach always looks good when the team is winning and your call for us to go to the Feather River was right on point. Ryan was great! His interaction with Andrew and his teaching us both made the day very successful. OK, the 20 or so fish helped as well!! Once again, Thank you very much for a great experience. My guides are ready for you over on the Lower Feather River, the steelhead season has already started. My guides Ryan Williams & Kayla Katayama both drifting the river fly fishing with rods and micro spey rods for steelhead and half pounders, lots of happy clients this season. Andrew Meyers on break from UNR Wolfpack loved his adventures both on the Upper Sac float and then the Feather River the next day on the way home. Mike Meyers ladies and gentlemen! What a great guy, actually won a national championship with Joe Paterno, his dad proudly wears the ring that went with that undefeated season, that’s a huge bonus about being a guide and meeting all these interesting people while out on the job. The Feather is fishing surprisingly good right now, at least by August standards. Great numbers of smaller fish with a few bigger around. We’ve taken fish this last month swinging wholly buggers and nymphing. Fox poopahs and bird nests have been top producers. Along with various mayfly nymphs. Mornings into the afternoon, both swinging and nymphing has been good, while all tactics including dry flies can be used in the evenings. She caught this beauty in the Feather River on her micro spey rod. Kayla is a senior at Chico State University, she is ready to help instruct any women, kids or polite adults. 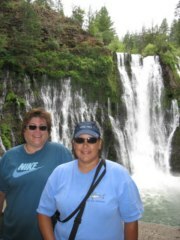 Another great female guide that rows a drift boat and guides fly fishing in Northern California and that’s a great thing! When we do these trips on the Feather River, we like to break up the day by wading the river a little and then float it some more. Lots of these nice healthy steelhead that give you a great fight always. Even pops getting into the action!! Kayla and her expertise in spey casting, showing mom how to cast out of the drift boat. With success I might add, this is one serious guide who has a lot of fun out with our clients. Give us a call to arrange your fly fishing trip this fall on the Lower Feather. Ryan Williams our fly fishing bass expert, fly tying guru and inventor on fly fishing with success on Clear Lake is busy pioneering more things out on his skiff. Flies that creatively catch fish is what Ryan Williams is all about. I’ve caught blacktip sharks in Cuba with his flies, I’ve caught monster browns in Chile with his flies and numerous others here locally with his patterns and devised cleverness. When it come to guides and new innovative ways to catch them, better hook up with Ryan Williams, he’s the bomb as they would say these days. Ryan Williams Legendary Lower Feather Steelhead Guide Extraordinaire & Rockstar Fly Tier. Nothing but net folks, he’s the Jordan of guides and a loyal Jack Trout Fly Fishing Guide. If you haven’t fished with Ryan, you’re in for a treat, try the Lower Feather this fall folks or combine it with a trip up north on the way home! Born down in a dead man’s town, The first kick I took was when I hit the ground. End up like a dog that’s been beat too much, till you spend half your life just covering up. Ya! Action has been good. We take the drift boat out for these and it’s a very long float. Great to get away from crowds and finding solitude, but it get’s hot and casting 9wts and shooting heads all day is allot of work. We’re getting about 20-25 hookups each drift. Lots of smaller schoolie fish. However each drift we’re seeming to get at least one “keeper size” fish from 4-9lbs. Action should remain good for the rest of the month and into September a bit. Action is good to great. Fishing about 90% topwater right now for spotted bass and largemouth. Been an exceptional summer for largemouth. Stripping big unweighted baitfish streamers on a floating line is producing good as well. Fun for visual takes. Very aggressive takes right now. Fish seem to be settling into the current dropping water levels. Big fish that have been sitting deep are sticking tight their usual cover, as the water drops it gives us a chance to target them in depths suitable for topwater. Some days, fish can average around 1-2lbs, while other trips fish we’ve seen fish to 5lbs. Guide Tip: Fish early mornings into the afternoon, or from 5:00pm until dark. Fish shallower areas for bigger fish. Action has been great. August is the prime month for fly fishing here. Fish are really aggressive and boat traffic is lighter than July. This is the month where 50-60+ hookup days become a possibility stripping streamers. Look for fish boiling on the surface. The bass are really keying in on shad right now which is perfect for the fly rod. Anything from full intermediate lines to Type 6 shooting heads do the trick depending on the depth. Kayla guiding on the Lower Sacramento River. I will fish the Deschutes for trout until Mid-August mainly doing day trips out of the town of Maupin. Then we switch to Steelhead on the Deschutes until November. Now that’s a great Deschutes River trout, fat, hard fighting and fun. 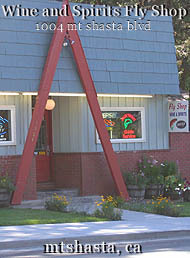 Home of the famous Red Side Trout. A very special trip with our special fly fishing guide Brian Silvey, give us a call to arrange your fly fishing adventures up in Oregon. Amazing views, amazing sunsets, multi-day floats and camp outs. My friend and I decided at the very last moment to go fly fishing for bones and tarpon in Cuba…. We contacted Jack Trout and he hooked us up with the most knowledgeable and fun to fish with guide (Felipe). We had the best time ever!!!! I would highly recommend Jack and his stuff to my friends! Link To My Television Interview On Cuba With Mike Mangas KRCR News. We have developed a wonder trip for fly fishing 2 and half hours from Havana, Cuba in the Bay of Pigs. If needed, all the gear is included and lunch and we have had many successful trips. Our clients have caught fish on fly rods from 8 wt. to 12 wt. including, tarpon, bones fish, permit, snapper, barracuda and shark. Give us a call to go over what you would need to bring, to have it all dialed for your trip. Catching baby tarpon in the flats of the Caribbean is got to be on the top of my list for personal fly fishing travel adventure, some of the best left in all of the world. I really love Cuba, but it’s not just the fishing. It’s the tours, the food, the culture, the cars, the beaches, the fruit, the historic museums, grilled lobster lunches with lobster aju caramelized by heat, Hemingway’s place, Mamay milkshakes, honey, sugar, cigars and the list goes on. If you haven’t been to Cuba, you really should consider it, now more than ever more Americans are going. We had an 185% increase in Americans visiting Cuba last year and we are now the #2 country exploring the wonderful places the entire island has to offer. Call us for any travel details, right now there are very little restrictions on going to Cuba. Call us for program details on what OFAC requirements you will need to travel. Jack Trout Fly Fishing International Inc. Is a supporter of the Bonefish Tarpon Trust and we direct our clients there for safe entry approve Governmental programs. Our guide Felipe with Emma Foster in the Bay of Pigs, Cuba with her first tarpon on a fly rod. https://www.tripadvisor.com/Attraction_Review-g147271-d12255319-Reviews-Cuba_Classic_Tours-Havana_Ciudad_de_la_Habana_Province_Cuba.html – Check Out Our Tripadvisor Page. 1st. Day tour in Havana city (regular program, from 9.00 am to 3.30 pm). – A walking tour around the historic part of Old Havana, which is a UNESCO heritage site since 1982 after the great colonial architecture very well preserved in that area where people can really see and appreciate a mix on different influences of architecture styles from the XVI to the XIX century and some stunning European style squares. Some stops could be arranged for drinks, photos and at to interesting historical places like: the old late XIX French style pharmacy, the hotel Hemingway used to stop every time he used to stay in Havana city, the old city scale model building, and many others. l The walking tour may last about 2 hours, so clients should consider to bring comfortable shoes with them. – A brief panoramic tour around the center of Havana city where some iconic buildings and spots are located such as: the Capitol building, the Grand Theatre of Havana, Central Park, Padro High Street, the revolution museum and the National Art Museum. The tour guide will give information about this centric area and couple stops for photos could be arranged if the clients may be interested. – Visit to the Revolution Square, which is the most important square in Cuba relates to the Revolution history and it has been the main scenario of political speeches, workers and military parades, so political concerts. Stops for photos and a short walk. – A visit to a cigar store for those who are interested on buying authentic Cuban cigars. We normally take our clients to the government store where they sell only the real and very fresh ones. We don’t recommend getting cigars on the black market as it is against the law and you are never sure if they are selling you fakes cigars or not. A 30 min cigar factory tour could be book but is only available from Monday to Fridays as workers have Saturday and Sunday off. Prices for prestigious Cuban cigar brands: from 7.00 to 22.00 CUC depending on the brand, size and strength. (The cigar factory tour price is: 10 CUC per person not included in the Havana city tour price). – A brief stop at the metropolitan Almendares Park located between the Vedado district and Miramar. This is for sure an excellent place for those who appreciate an always green and natural forestry area for taking wonderful photos. It is mostly used by local people for family meetings, picnics, photography and religion rituals. – Panoramic tour around some 1930’s, 1940’s and 1950’s neighborhoods such as: Miramar that it was the richest people area before the Revolution victory and the embassy are now days, Malecon promenade and Vedado close to the American embassy and national hotel. – Lunch time in a local private restaurant (price not included in the tour). 2nd Day tour (external areas and some Ernest Hemingway places, from 9.00 am to 3.30 pm). – Exploring of important places at the other side of Havana city Bay where big Spanish colonial fortresses are located which are used for protection from the pirates attacks and Spanish empire enemies. Stops by the Morro Castle for a fantastic panoramic picture of a big part of the city, some minutes at the 1962 missile crisis military exhibition and Jesus Christ Park. – A visit to Jose Fuster street artwork project which since the 1990’s has been the most significant open artwork neighbourhood in Havana city inspired by the catalan artist Antonio Gaudi. – A short visit to Cojimar town where Hemingway used to keep his boat for fishing and he met Gregorio, an old locale fisherman who becomes later his inspiration for the famous novel The Old Man and the Sea. Stops for drinks. – A horseback riding tour (10 CUC per hour) for enjoying much more the unique scenery and landscape (optional). – The visit to the Indian Cave, which is an small cave located inside one of the monolithics of about 250 meters long. Part of the tour in this cave is by boat, so at some points of the day when the cave might be full of tourist clients can easily wait for up to one hour to jump on the boats. I recommend to make a decision on the tour day. The cover for getting in is 5 CUC per person (not included on the tour price). – A visit to a local tropical botanical garden that has been kept for one family in Viñales for about 100 years. (Optional) Price: free. – Lunch time at a local restaurant (not included on the tour price). Our guide Jesse Aguilar with our client Leticia and her daughter, had a great tour this week out to Santa Maria Beach. My family and I had 2 tours with Cuba Classic Tours. Our guides were friendly and well informed. I would definitely recommend seeing Cuba with them. Both tour guides provided loads of information during the tour and were open to questions. We toured Havana on 1 day and Matanzas on another. You really need good walking shoes and if you’re going to the cave, no sandals, wear sneakers. Also the tours were based on what we were interested in seeing. to have a great time at a Cuban beach. Jack Trout set me up with a guide in Spain, the guide was excellent and made great accommodations for me to go on a full day trip. The Guide was experienced and fairly patient when teaching me the new techniques of Catalan Nymphing. From the peaks in the Andorran region of Spain, flow perfect pristine waters as it makes it journey down the mountain sides into lower lands streams of the river Ter and river Segre, before heading out into the Mediterranean Sea in the Bay of Biscay. The food, the wine, the views majestic and heavenly. Our clients Jake and Ginger Hervey with friend Dylan Eustice up on some mountain lakes on top of the world. Great fishing for a day for these mountain brook trout. Hey Jack, had a fantastic time, great overall experience! Yes, second day caught a lot of brook trout up I’m some lakes in Andorra. Here’s a few pictures from there, when I get a chance I can send a more detailed review and more pictures. Whoohooo!! Happy clients in Pyrenees Mountains of Spain. Our guide Joan Soler is the best fly fishing guide in Spain. The mountains of Hercules & Hemingway, maybe it’s time we talk about a trip to Spain by train. This is how our program works – You get to Barcelona, most arrive by train. We pick you up and take you into our area about 2 hours away. Then you fly fish for how ever many days you want. 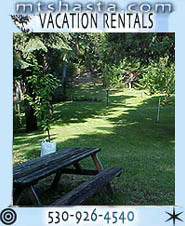 We can help with lodging too as well as what are the best restaurants in each town. 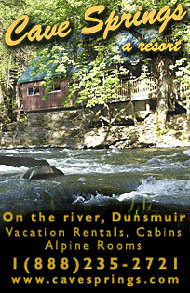 Lodging at http://pasteral.com 2 People In One Room – 4 Nights 3 Days Fly Fishing w/ Lunch On The River Included. $100USD Round trip for ride from Barcelona Train Station to fishing and back. Some rivers open on October 15th, like the Rio Maullin out of Puerto Montt/ Puerto Varas Chile. My guides are excited for a new season and are getting all their gear and equipment ready. Big browns require big nets and Mattias knows how to catch them on his 1300 acre property with private river access. In addition we guide on the Rio Petrohue in the Lakes District of Chile and on the Rio Rahue & Rio Calcurrupe up north in the Rivers District. We also are offering our 10 day package in 4 star hotels for 9 nights, 7 days of fly fishing in Chile and Argentina, including all meals. $5700 per person, minimum 2. The most incredible two country fly fishing trip on the planet. We only offer this trip in late February til April, after the school kids go back to school and the tourist season is over. Call to see list of open weeks. Many happy clients over the years, our 25th season outfitting fly fishing and tours in Chile and my wife Carola’s home country. We can save you money, no one can provide a better experience for a better price in Chile than Jack Trout Fly Fishing International. It’s our experience that makes the difference and we have learned so much that can help you over the years. Let us help you! What a great catch any where in the world, but when you do it in Chile, it counts as twice as fun! Big huge healthy browns in incredible totally natural environments. 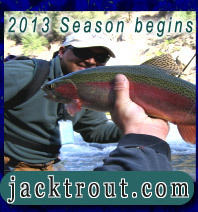 Jack Trout Fly Fishing International, The Leader In Chilean & Argentina Fly Fishing Budget Adventure Travel. You don’t need to bring your gear, it’s all included, we only use the best boats and equipment for affordable prices. We can help with lodging, rent a cars, air flight discounts, restaurant lists, itineraries and keeping safe while you travel. We are experts in South American travel and are #1 on Tripadvisor in the world for fly fishing outfitters. You can put your trust in us and we will always return your calls promptly, we are serious about what we do for you and understand how important these trips are for you, your family, colleagues and love ones. We it comes to fly fishing Patagonia Chile, we only work with the best! 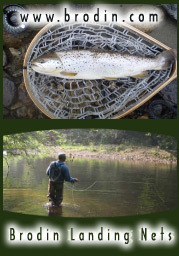 Our clients learn how to catch real huge brown trout on flies. Our guide speaks great English and is a character as well as an awesome guide. The scenes are priceless. We offer one day trips for fly fishing that include gear and a great bbq lunch out of Punta Arenas and Puerto Natales, Chile. We serve cruise ships and people traveling by rent a car. No need to buy an expensive package if you don’t want to, we have a Jack Trout Fly Fishing International Guide in every area they have fly fishing in Chile, Argentina, Bolivia, Brazil & Ecuador. Let us help you onto successful fly fishing adventure travel. I contacted Jack after a lot of research on fishing guides in Patagonia and boy did it payoff! I was a little worried at first because 1) we were on a cruise ship which meant tight schedule. and 2) the day of our port was Christmas Day. Neither of these proved to be issues and everything went smoothly. Communication is excellent, Jack or his wife are very responsive, i had no issues getting answers to m questions. 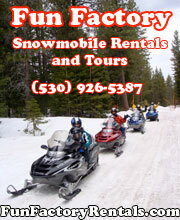 Everything is in order and super smooth from initial booking, to meeting details, to sizing equipment. They hooked us up with a fantastic guide in Punta Arenas, Rafael. He was knowledgeable not just about fishing but about the area, he was funny, and he was a great sandwich maker!! On the way to the river, he had no issue telling us about the area or pulling over to show us things, we saw wild flamingos, parrots, rheas, ducks, and a blue eagle! I am a seasoned flyfisherman but this was my wifes first attempt. he was very patient with her and was a great teacher! She was on a fish not long after my first! We each caught 3 trout, my wife caught 2 20 inchers! Rafeal also had a fantastic lunch for us, like i said expert sandwich maker! He was punctual, met us on time and had us back to the boat on time, big deal as like i said we were on a tight schedule being on a cruise ship. I have hired a few guides in my time, but Jack/Rafael were hands down the best i have every had. I will be planning a trip to California to have Jack put me on some big Rainbows!